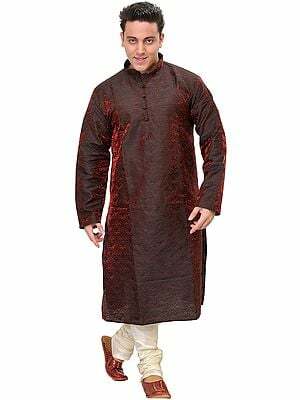 This kurta abounding in rare lustre has been crafted out of a textile length known as art-silk. 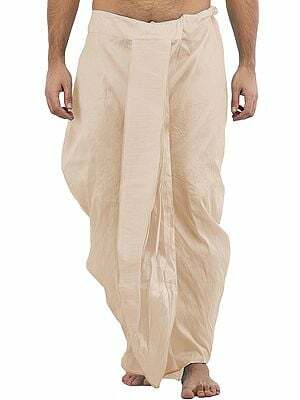 Imitating silk like texture, similar appearance and even same softness in touch as has a silk piece, art silk is also called imitation silk. 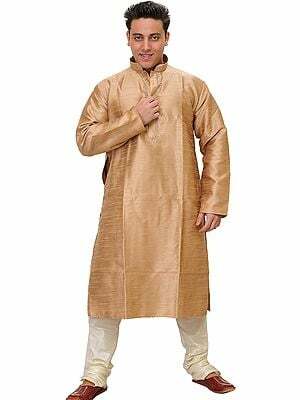 The fabric used in manufacturing this kurta, otherwise an artificial synthetic fibre and economical substitute of real silk, both in initial cost as also in maintenance, manufactured with greater technical accomplishment obtaining the same look as genuine silk, is known in the textile industry as art silk as also imitation silk. 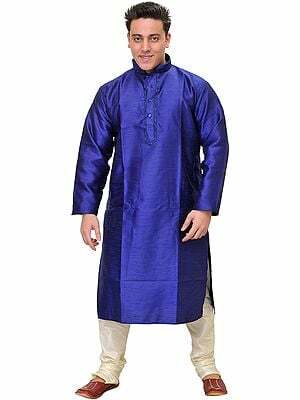 Such synthetic art silk or imitation silk is made using rayon, mercerised cotton, polyester, a blend of these materials or just that of rayon and silk. The Satpath Brahmin and other ancient texts to include Buddhist and Jain allude to Kausheya, perhaps a silk obtained from cocoons, and various plant fibres and some grasses that afforded clothing to different classes of people those days. Kausheya, something like the present day’s art silk, was especially prescribed as the wear of kings or rich hosts holding yajnas and head priests presiding over them. 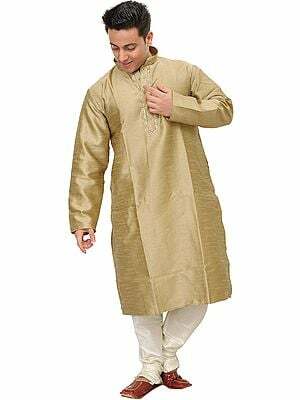 Obviously, Indians were using artificial fibres for manufacturing their garments about three millenniums before the modern science discovered in around 1890 rayon or polyester type modern sources of clothing. 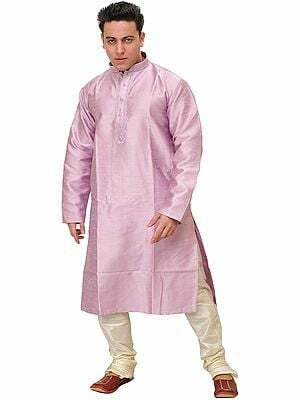 It is for such reason that in context to India any class of clothing breathes an air of ethnicity, and when it is in regard to synthetic silk, or a wear like kurta, this feeling of ethnicity doubles. 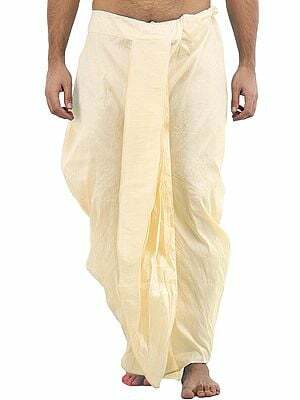 As ‘ananda’ – celebration even of death, has been the guiding principle of India’s life and thought, adornment of things of day-today’s use has been the guiding principle of her culture. 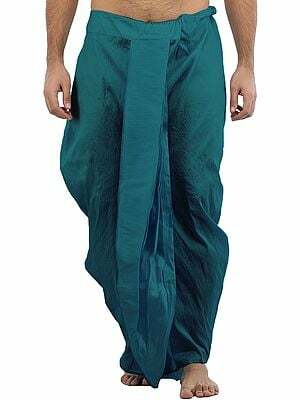 Though unstitched lengths of textiles constituted the components of his main ensemble – dhoti, sari, turban, uttariya … he always sought to beautify them. 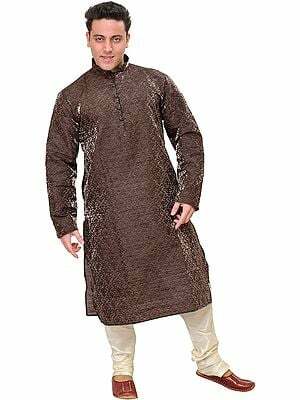 In stitched ones a kurta affords greater scope for embellishment and even a simpler piece affords scope for a design-pattern to define at least its collar and button-band. 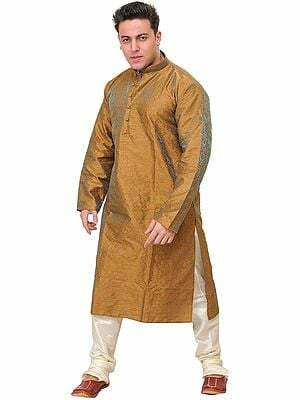 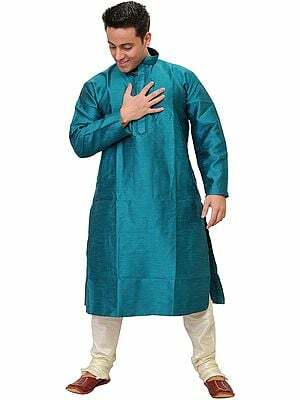 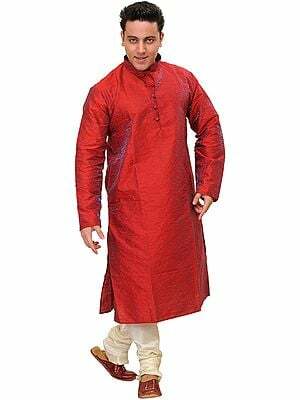 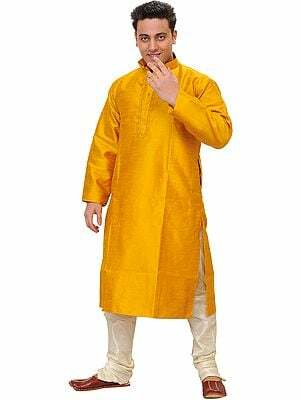 A kurta also affords greater scope for ingenuity as regards freedom in length, styles of sleeves, modelling of various parts and in its embellishment. 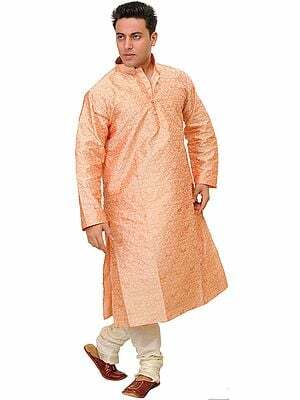 Can I wash this Plain Wedding Kurta Pajama with Embroidery on Neck in a washer? And if so is there any special instructions? 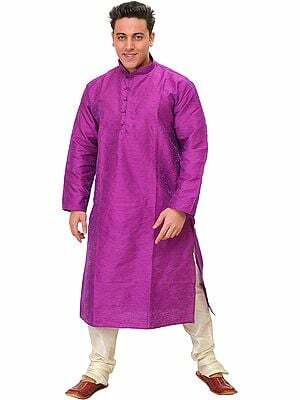 I'm going to send my Chase Bank check $55.00 this evening March 19th '15. Nobu Urushiyama.